Knowing the winds is very important because the sailing style depends on the type and strength of the wind. Maestral is a typical Adriatic summer north western wind and one of those winds that are characteristic for beautiful and stable weather. It's a daily wind created by the differences in temperature between the mainland and sea. It is fairly frequent from spring to autumn and strongest in July and August. It usually starts blowing between 10:00 and 12:00 in the morning and reaches its highest strength around 17:00, slowly fading till the evening. On the Beaufort scale it's usually between 3 and 6. (12-49 km/h). Maestral is suitable for learning fun techniques or new freestyle tricks, and with regard to the fact that it creates waves up to 150cm in height, it is also suitable to practice your jumps. During the day, Maestral can often turn on Tramontana. It is a colder northern wind of moderate strength with strong gusts, that usually forms in clear weather. Its strength is 5-10 (29-102 km/h) on the Beaufort scale and its waves can reach up to 3 meters which makes it the most desirable wind of many windsurfers. Burin occurs due to the difference in temperature between land and sea and is enhanced by the force of gravity while coming down from the hilly banks. It blows from north-north east early in the morning and reaches a strength of 3-6 (12-49 km/h) on the Beaufort scale. Premantura, Istria - the southernmost village of the Istrian peninsula open to absolutely all the winds that blow in the northern Adriatic. Savudrija, Istria - 3 different winds blowing arround Savudrija peninsula almost every day in the year makes it a true windsurfing paradise. Preluk, Kvarner - the Tramontana blows here almost every morning and offers unforgettable surfing or sailing experience, both in summer and winter. Brac island - a favorite destination for surfers from all around the globe. The channel between the islands of Brac and Hvar, and the wind that blows there, provide ideal conditions for windsurfing. Viganj, Peljesac peninsula - thanks to the channel between Peljesac and Korcula, Viganj is a favorite meeting spot for wind and kitesurfers. The ideal conditions are also the reason this part has hosted many windsurfing championships. In lack of surfing conditions, Croatia has excellent (if not ideal) windsurfing conditions! 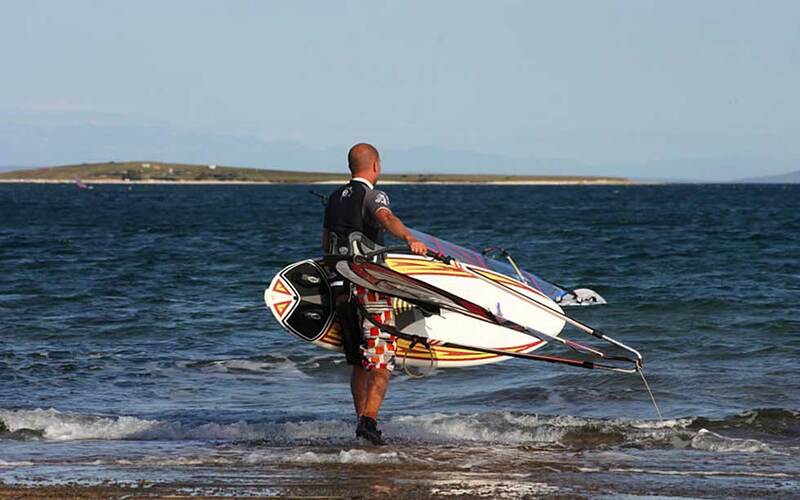 Except the fact that day by day windsurfing is an increasingly popular sport, for many it is a way of life. In search of constant thrills fans of sailing cross thousands of miles to reach a suitable beach and enough good wind. Wind we have (sometimes even a bit too much :P ), we're also full of sun-kissed beaches..a bit more interest and better organization and Croatia's opportunity for another pre/post-season activity will flourish.